Nadia Ernestus makes sauerkraut fit for a king. Nadia Ernestus’s Sag Harbor kitchen is alive with invisible helpful creatures. Otherwise known as friendly bacteria, these airborne microorganisms are powerfully attracted to such cultured foods as yogurt, sourdough bread, and fermented vegetables. A growing body of research suggests that good bacteria regulate and strengthen all manner of bodily processes, especially digestive function. Fermentation evangelists like Ernestus believe that one way to introduce beneficial bacteria into the gut is through a diet high in lacto-fermented foods. 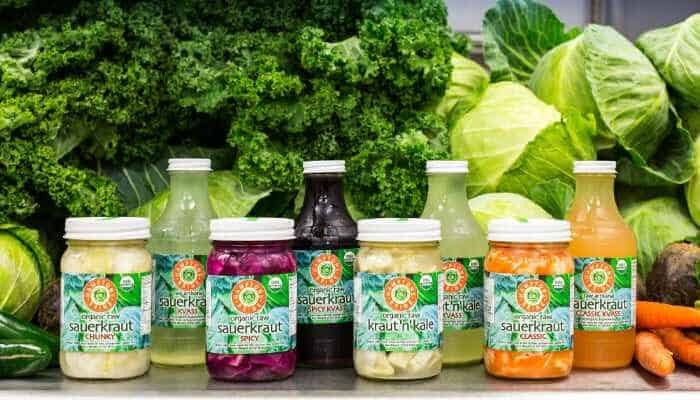 Ernestus is the owner of Hamptons Brine, a small start-up that makes raw organic sauerkraut and, as the name suggests, other delicious briny foods, including a probiotic-rich tonic called kvass. Most people would be eager to leave their work behind at the end of the day, but Ernestus likes to pickle, ferment, and preserve good things to eat in her free time. On a recent Saturday, she offered glasses of water kefir flavored with pomegranate concentrate to guests. Big jars of shredded cabbage with cranberries were fizzing away on her countertop. (“The good guys are eating up all the sugar in the cranberries and they’re gassing like crazy!” she said.) Nearby, green apples which she’d buried in sauerkraut were soaking in honey-spiked water to temper their saltiness. Garlic and dill-flavored carrots; green tomatoes with green chilies, and even locally-foraged chanterelle mushrooms, all at various points of readiness, were also allowing time and sea salt to do their work. For Ernestus, fermented foods aren’t just a livelihood but a mission. She considers them medicine, and she has a sheaf of letters from grateful customers who share her belief. Her own Road to Damascus moment took place four years ago. She was working in real estate “just like everybody else” when she was diagnosed with Type 2 diabetes. Rather than treat the condition with drugs, she succeeded in managing it through a radical change in diet. The experience prompted Ernestus to embark on a short-lived career as a health coach. Once she’d completed her studies and had established a practice, she realized she didn’t have the temperament for such work. On the other hand, she did enjoy the fermentation classes she’d begun teaching at the Hayground School, in Bridgehampton, and she loved making sauerkraut, and so Hamptons Brine was born. Today, much of her business consists of mail order, though you can also find her products at local health food shops throughout the East End. Two years ago, the business obtained organic certification. Around the same time, she walked out on a deal with Whole Foods, making the decision to keep things small. It turned out to be the right move. Assorted hot peppers, about ¾ lb. Put mustard and/or coriander seed in bottom of jar. Separate the garlic cloves, peel them and add them to the jar. Snip the stems off the peppers. Pack them firmly into the jar to fill to about 1 inch from the top (to the lower rim). Place a small weight on top, and then add brine to cover completely. (It may be helpful to put a cabbage, grape or oak leaf on top to prevent any peppers from poking above the surface.) Make sure all the solids are fully submerged. Allow to ferment 4-5 weeks until all bubbling has ceased and peppers have lost their crunch. The peppers will be considerably reduced in volume, with quite a lot of brine at the bottom. Place dried tomatoes in a bowl. Ladle over enough of the brine to cover them, and let them sit overnight until softened. Purée the fermented peppers, rehydrated tomatoes and all the brine until smooth. Pour back into jar and let sit a day or two for flavors to meld, then bottle and refrigerate.